I put up a post on fb yesterday in a group that is part of my personal development journey. The comments that I got about the changes that I’ve been making are so encouraging. A mentor of mine, Peter Shaw, from Scary and Exciting said that I’d gotten the consistency right. I’ve always been big on telling people what I want to do, yet found that it didn’t really do much from a motivation perspective. Because they’d already done the oooohhh, ahhhh, interesting and that left very little juice left in doing the task. This year I have been committed to as little effort as possible for all my major goals. I didn’t tell anyone I had decided to stop eating past the ‘full point’. I didn’t tell anyone that I was giving up smoking til I knew that it was properly motivated. The ‘accountability’ that is spoken about in telling everyone so they hold you to account, only works if those people want to hold you to account. I’ve found in Australia particularly that the ‘tall poppy syndrome’ is subtle and pervasive. There is very little encouragement and outright joy at other’s fortunes. I reckon secretly succeeding is an awesome feeling, great motivator and easy to fail at – cause no one knows. So you can keep trying and trying, til it works. 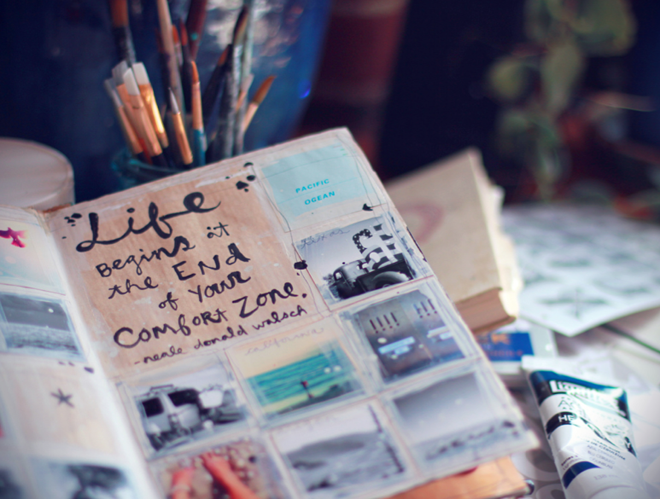 Life begins outside your comfort zone – being comfortable with being uncomfortable is one of the keys to making this work. Just being uncomfortable with no real idea of why, although it works at strengthening your self belief, I found wasn’t very effective at specific targeted changes. I did love doing the cold shower challenge. THAT will strengthen your lungs from shock breath intake alone! This year I found having a support network to talk me down, to help me ride out the uncomfortableness during the time of baby step changes, really made the world of difference. Mostly my ‘uncomfortableness’ wasn’t physical. It was a huge mental and emotional uncomfortableness. Letting go of all the ideas of past failure, what success will mean, new problems that will come up because of it… the comfort of NOT knowing all the answers and trusting in life to teach me, the same way it’s taught many generations. Through doing, trying, ‘Nike’ and all other ‘DO’ related sayings. Every day do something that scares you – this doesn’t mean white knuckling terror – it could simply be to even consider becoming comfortable with being uncomfortable.